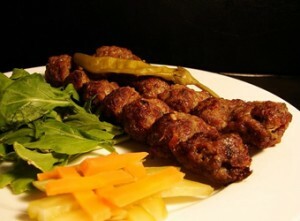 Afghani Kebab recipe by Habib Akhtar at DesiRecipes.com. There are several kind of kababs. This is a very simple, easy to make recipe of Afghani kababs(mince with green masala). them, separate into four portions. Brush each portion with a little oil. In a flat frying pan flatten and place one portion and cook for 4 minutes. Repeat with the other portions then cut each int strips. In a wok (karhai) fry the pieces slightly, add tomatoes, salt and a few green chillies and black pepper . Cook till oil separates, garnish with coriander leaves . Do you have these recipes in imperial measurements? its simple....want something more simple, oil an egg. just signed up at www.pakirecipes.com and want say hi to all the guys/gals of this board! I agree with Sadia. Post a video. I rated it 1 just because the method is not very clear to understand. Do you cook both sides once you put the one portion on a flat frying pan? And how long do you fry each side? Do you deep fry in the wok? How much oil. Do you brush on the tomatoe paste ont he strips or do you put all of the tomatoe paste with the strips that you are frying. This recipe is not thoroughly written to follow to make the perfect kababs.